Many years ago a friend of mine working as a copyist for Universal Edition was involved in the publication of some of Murail's chamber music. She said that in her estimation Murail was a composer of real significance. However it has proved quite difficult to hear much of his music either on the BBC or on CD. To make some amends we now have the complete piano music dating from between 1967 when the composer was still a student through to 2003. This covers a period of thirty-six very significant years. Across that period we see charted the composer's progress and development in one very telling and disciplined medium: the piano. So what can you expect to hear? 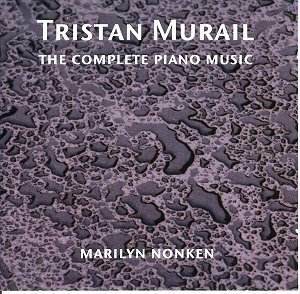 Murail was a pupil of Messiaen and won the Prix de Rome in 1971. The early Comme un oeil suspendu et poli par le songe ("Like an eye hung and polished by the dream" - my translation) is described in the press notices as 'newly discovered'. It is not much more than a clone of his teacher in its harmonic progressions and rhythms. However there is also a feeling of something beyond Messiaen which climaxes twenty-five years later in the beautiful brief Cloches d'adieu, et un sourire ("Farewell bells and a smile"). This is a wistful and thankful farewell to his teacher which, although showing his influence, has most certainly moved on significantly and become a more personal statement. What had happened in between? One important development was Murail's work in the electronic music field. In the eighties he started using computer technology to further his research into acoustic phenomena. From 1991 to 1997 he worked at IRCAM and helped to develop the 'patchwork' composition programme. This influence has fed into creating a style now known as 'spectral music'. The meaning is difficult to pin down but the best description I can give is: a recorded pure sound is transformed in a way which makes it entirely different from its starting point. The full range of acoustic sounds is used from the highest to the lowest. The way this can be transposed to the piano can be heard in the textures of the forty minute span of Les Travaux et les Jours (Works and Days). This divides into nine manageable sections which are inter-related but which each display a different sound-world. Number six reminded me of Ligeti with its falling cascades of scales tumbling at slightly different speeds - all quite beautiful. The third movement also intrigued me, consisting at first, of a repetition of long-held Messiaen-like chords (quite a finger-print this throughout the disc) with gentle splinters above. This then evolves into a shower of notes which, bird-like, flutter overhead and then combine with the original chords. The composer's own programme notes which accompany this double CD comment that there are "nine independent pieces, but minutely intertwined. The music revolves around a B-C tremolando and is supported by a low F which is only fully unveiled at the end of the cycle". One is, as it were, left in suspended animation. I found it quite gripping. More so in fact than the thirty minute Territoires de l'Oubli (Lands of Oblivion). The younger composer here does not quite bring off his scheme where he is trying out new 'acoustical phenomena�. He uses gentle repetition of a low D sharp over a major 7th with harmonies clarifying and then vanishing into the sustaining pedal. The composer talks of acoustic interference which "modifies and enriches the colour". But with its opening tremolando crescendo the piece demonstrates that peculiar French sensibility to sound for the sake of sheer pleasure - total sensuousness. The sounds create the form if there is one at all; a state which Debussy (and for that matter Dutilleux) might have ideally wanted in his piano music. I have to say that this piece takes too long in creating its final culminatory experience. Estuaire divides into two movements. The first, Près des rives (By the riverside) is the shorter one and demonstrates another aspect of Murail's colour scheme. This one is darker, sterner and even, more violent. Its successor, Au mélange des eaux (On the blending of the waters) is left to brood on its consequences. Neither piece outstays its welcome and as a whole the work makes a strong impression. Finally La Mandragore ('The Mandrake' - a magic, wild plant) inhabits a similar sinister sound-world to Près des rives. It is remarkable in its use of bass sonorities and in the repetition of one particular chord. At nine minutes or so it just reaches its right length before vanishing. I have lived with this music, all new to me, for a month, and I am sure that my time has not been wasted. While listening I am constantly possessed by an impression of something beyond the world, not conventionally religious, but spiritual. This is music to which I shall be happy to return. I have reviewed several Métier discs over the last few years and find that the recordings are often not of the best quality. However on this occasion there is nothing between the music and the listener; that can only be considered an accolade. As for the performances you can rest assured that in Marilyn Nonken we are hearing a musician of outstanding qualities. It is evident that she knows, strongly characterises and loves this music. She has performed it and many other 'difficult' contemporary works all over the world and is a pianist in whom we can trust. Her mastery of Murail's sonorities and her virtuosity are truly remarkable and demand attention.